A bit off topic, but I wanted to share with you a true story of my house getting hit by lightning this past weekend. Had just finished watching the major league debut of Bryce Harper with the Washington Nationals against the LA Dodgers - they lost 4-3. I went outside to look at the sky as I always do every night before I retire and noticed there was some lightning in the distance, so I watched the display for a bit. I went inside and got ready to turn in and left open a drape so I could look out and watch the display. At a little after 1 a.m., there was a red colored sphere of light that appeared through the window with a incredibly loud explosion. Well, all I could think of was that it was a lightning display that was literally right on top of me. About 60 seconds later there was a bolt of lighting that was so bright it stayed in my retina for about a minute - followed by a tremendous "boom" that was almost instantaneous to the lightning - so I knew it had to be very, very close. The whole house shook. Well, needless to say, I was quite taken aback from this "up close and personal" interaction with such a force of nature. I had to reset a few electrical circuits that had popped but I thought nothing more of the event until daybreak. When I awoke to the sound of what I thought was a noisy newspaper delivery vehicle - more on that later - I just turned over as it was about 5:30 a.m. Upon rising for the day I went out onto my deck and there to greet me was a piece of roofing shingle. In looking up at my roof there was torn aluminum sheeting and more blasted shingles. Further examination revealed no telephone and the irrigation controls were literally fried. My neighbor across the street had his smoke alarm go off and three fire trucks roll in on what turned out to be a smoky insulation fire - a very small one but smoky caused by electrical discharge from either water or gas lines.....caused by electricity coming into his basement utility room....probably from our two lightning strikes. There were other stories to be heard, corroboration of the facts witnessed and seen in the torn metal and blasted shingles. I found out today if I have a hole in my roof and begin the process of insurance claims and the various repairs needed. Bottom line is that lightning is a powerful force of nature and a deadly one at that. I was less than 20 feet from the point of impact and it was literally right over my head. It could have been so much worse - a fire, a blast that penetrated through to my bedroom ceiling.....my neighbor's fire could have been worse and my neighbor that happened to be pulling down her bedroom shade at the instant of the strike could have hurt herself as she fell back in fear from she saw and witnessed in that instant of raw, unbridled power. NASA has just released the very latest results of DAWN's continuing mission at Vesta, the 2nd largest asteroid in the solar system. As related by NASA, "Spacecraft images, taken 420 miles (680 kilometers) and 130 miles (210 kilometers) above the surface of the asteroid, show a variety of surface mineral and rock patterns. Coded false-color images help scientists better understand Vesta's composition and enable them to identify material that was once molten below the asteroid's surface. " "Researchers also see breccias, which are rocks fused during impacts from space debris. Many of the materials seen by Dawn are composed of iron- and magnesium-rich minerals, which often are found in Earth's volcanic rocks. Images also reveal smooth pond-like deposits, which might have formed as fine dust created during impacts settled into low regions." "At the Tarpeia crater near the south pole of the asteroid (pictured below), Dawn revealed bands of minerals that appear as brilliant layers on the crater's steep slopes. The exposed layering allows scientists to see farther back into the geological history of the giant asteroid. " "The layers closer to the surface bear evidence of contamination from space rocks bombarding Vesta's surface. Layers below preserve more of their original characteristics. Frequent landslides on the slopes of the craters also have revealed other hidden mineral patterns." "These results from Dawn suggest Vesta's 'skin' is constantly renewing," said Maria Cristina De Sanctis, lead of the visible and infrared mapping spectrometer team based at Italy's National Institute for Astrophysics in Rome." This is about as good as it gets for "one stop shopping" in learning about the Sun, space weather and the related events caused by them that can affect our planet - and us. I have this saved as a favorite and I think you will too....a great reference and very educational. 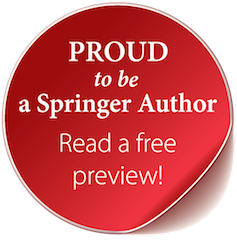 A just published article states that the Earth had 70 asteroid impact hits on the level o,f or even larger than, the dinosaur killing impact event 65 million years ago. This is a significant increase in the number of "mega-hits" the Earth was thought to have endured 1.8 to 3.8 billion years ago. The Moon is thought to have been hit 4 times with the same size impactors. "Evidence for these impacts on Earth comes from thin rock layers that contain debris of nearly spherical, sand-sized droplets called spherules. These millimeter-scale clues were formerly molten droplets ejected into space within the huge plumes created by mega-impacts on Earth. The hardened droplets then fell back to Earth, creating thin but widespread sedimentary layers known as spherule beds. The new findings are published today in the journal Nature." Yesterday a news conference was held in Seattle, WA that was historic and may be a watershed event in the history of humanity's exploration of space. 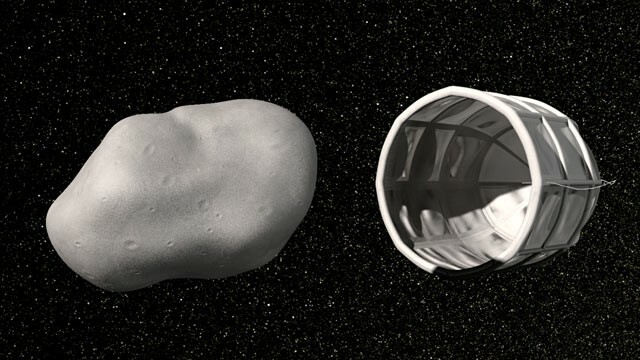 Several billionaires revealed their new company, Planetary Resources, and their goal: to make money mining asteroids and setting up gas stations in space. The very ambitious plan states that their fisrt spacecraft will fly in 24 months. Their team is made up of people used to getting the job done and it will be interesting to see how this latest commercial space venture plays out. I hope they succeed for the benefit of all humnanity, which is one of their recurring themes on their website. Get out tonight, 4-24-12 and enjoy the Moon and Venus. It will be a show stopper! Once again, Happy 22nd anniversary in orbit, HST, see my last blog. 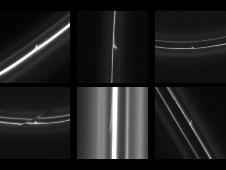 NASA's Cassini spacecraft continues to amaze as new images were obtained that show one of Saturn's many moons punching through the "F" ring of Saturn and leaving a trail of debris behind. Saturn's rings and its moons are intertwined and you can Read More About It here: http://www.nasa.gov/mission_pages/cassini/whycassini/cassini20120423.html and tune in to the excellent video. Saturn is now at opposition in Earth's sky which means it is directly opposite the Sun and in our sky all night. Saturn rises at sunset in the east and is keeping a star, Spica, company. Saturn is detectable by its steady appearance in the sky as opposed to a twinkling star. I'll let you know when the Moon will be passing by Saturn so you can zero in on its location. I have not viewed Saturn yet and look forward to do so and sharing some oils with yo. HST celebrated 22 years in orbit on April 24th - the day it was launched to space aboard Discovery. Kind of ironic that HST is still operational and the spacecraft that launched the telescope is retired. The image is of a spectacular star forming region located in the Large Magellanic Cloud called 30 Doradus. The picture is the largest mosaic ever made by HST. HST has a few years left before it is retired. The historic instrument will be deorbited and burn up in the atmosphere - wish HST could stay in orbit as a perpetual museum piece in low earth orbit. HST is visible to the unaided eye and it would be there for us to see and reflect on all it has done to revolutionize our understanding of the Universe. Tonight (4-21 to 4-22) will be the peak of the annual Lyrid Meteor Shower. Viewers in a dark location away from bright lights should see about a dozen meteors an hour. The Moon will be out of the sky and the peak is set for 1-2 a.m. on the 22nd, which favors North America. We will be clouded out for some much needed rain here in VA.
Look to the northeast at 10 p.m. to find bright Vega and use it as a guidepost to watch the for the meteors streaking across the sky. The meteor shower is called the Lyrids because the radiant, or the point in the sky from where the meteors appear to radiate from is in the constellation Lyra. Vega and the radiant will climb higher in the sky as the evening goes on and will be very high in the sky at the predicted peak time. As related by NASA, "Lyrid meteors come from Comet Thatcher. Every year in late April Earth passes through a stream of debris from the old comet, which has been bringing Lyrid meteors to our planet for at least 2600 years. Specks of Thatcher’s dust hit the top of atmosphere at 110,000 mph and disintegrate in a flurry of meteors." NASA is trying to take the first ever 3D photographs of a meteor shower by combining images from amateurs, a weather balloon and from the International Space Station. Place this in the cool and zany file....Students in Bishop, CA flew a rubber chicken to the edge of space during a solar outburst to conduct solar radiation experiments. The students had a successful flight as the picture above shows and after some analysis they will know what Camilla was exposed to along with sunflower seeds and seven insects. I love the pic and the fact that these students are getting to do real science experiments. The pic alone is amazing. NASA just announced that DAWN, currently in orbit around the second largest asteroid Vesta, will get an additional 40 days for observations. This is GREAT news as it will allow more time to accumulate data and images of Vesta before heading out to DAWN's next target, Ceres. The spacecraft will still arrive at Ceres on its original target date in February 2015 although it won't leave Vesta until August 26, 2012. It was gratifying to see the attention and turnout in Florida, Washington, D.C. and Northern Virginia today for Space Shuttle Discovery. I watched her at Ronald Reagan Airport for 3 flybys - the first one being the best and VERY CLOSE as you can see from my pic below. Throngs of people stopped what they were doing to see the once-in-a-lifetime spectacle of Discovery flying for the last time. The sheer size of the Shuttle Carrier Spacecraft (SCA) - a heavily modified Boeing 747 - and Discovery piggybacked, was, well, spectacular. I have seen Challenger at the mate-demate facility at Edwards Air Force Base in California (still have the slides that I took through my 8-inch telescope), Endeavour on a night launch in 1995, and Enterprise at Udvar-Hazy. I am sure I will see Atlantis at the Kennedy Space Center someday. But to see the workhorse of the shuttle fleet, just as she looked after return from orbit - seared, used and FLOWN - was impressive. Discovery will be on display at Udvar-Hazy in just that mode - as if she had just returned from space - for generations to see. The shuttles are part of history now, no longer making it as they fly in space. We must await the next generation of manned spacecraft - Orion- to see what it can accomplish in space. I have watched Mercury, Gemini, Apollo, Skylab and Space Shuttle. I eagerly await the sight and sound of "fire on the pad' as the next generation of astronauts and spacecraft hopefully will go where no one has gone before and return to where we have been - the Moon. Welcome Discovery, your flying mission is done. You now will inspire and amaze all who look upon you. Her new mission starts on April 19, 2012 at the Udvar-Hazy Air and Space Museum. If the weather cooperates Space Shuttle Discovery will be flying from Kennedy Space Center (KSC)to Northern Virginia-DC NVA-DC) tomorrow, 4-17-12. 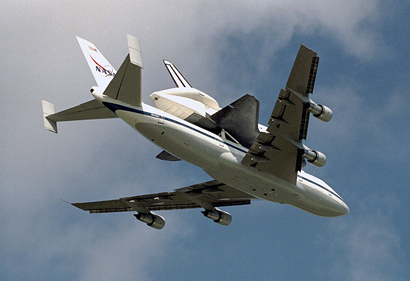 Discovery will be piggybacked aboard NASA's 747 Shuttle Carrier Aircraft (SCA) for the very last time as she head to Udvar-Hazy Air & Space Museum near Dulles Airport. Takeoff is currently scheduled for 7 a.m. at KSC with arrival in NVA-DC airspace at 10 a.m. with arrival at Dulles scheduled for 11 a.m. NASA (all times approximate. I hope to get some pictures myself tomorrow ad share them with you. Did the Moon Sink Titanic? We take on a nautical flavor today, April 14, 2012, as tonight at will mark the 100th anniversary of RMS Titanic hitting an iceberg at 11:40 p.m. local time and sinking less than 3 hours later with the loss of 1500 lives. Last night I watched the National Geographic Special that had James Cameron and a panel of experts put together a forensic examination of the great ship's sinking. It was fascinating to watch and I learned much. There are astronomical aspects to the sinking of Titanic that have come forward on the 100th anniversary and they involve the Moon. First and foremost, there was no Moon to illuminate the calm sea and help the lookouts and watch officers see icebergs. These crew members also had no binoculars or optical aid to help them scan the horizon as they had been left behind accidentally on the ship's maiden voyage. I can tell you from personal experience that to not have binoculars while on watch aboard a ship is leaving you blind - especially on a moon-less night. The other Moon-Titanic aspect involves the Moon's tidal influence on the icebergs. A serious study of the timeframe involved revealed that the Earth-Moon-Sun alignment in place could have produced very high tides that could have refloated grounded icebergs and put them in the shipping lanes and ultimate path of the Titanic. And if you happen to be outside at 11:40 p.m. or after 2:30 a.m. on the 15th, take a look at the sky. The stars will be essentially the same except for some latitude variations and the planets present. But the stars will be the same as they were 100 years ago as the survivors and those killed saw them. Webb Space Telescope Goes Into "Space"
Major components of the James Webb Space Telescope (JWST) are preparing to go into "space". JWST will not be riding a ticket just yet to get there but rather a crane that will lower the components into a huge thermal vacuum chamber at Goddard Space Flight Center. 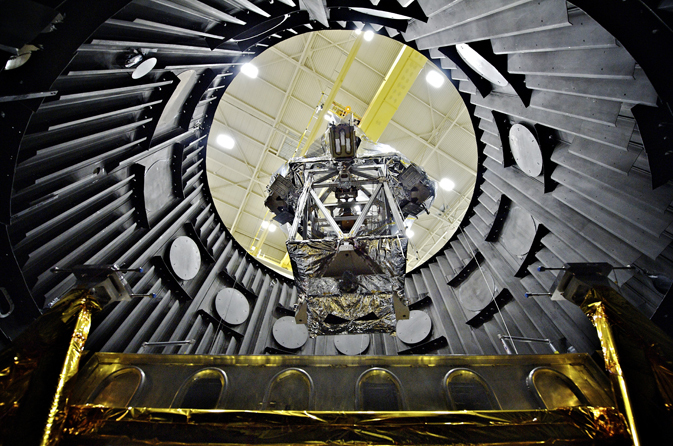 The components will be subjected to the simulated environment of space and tested to insure they perform as will be necessary when JWST becomes the successor to the Hubble Space Telescope. Something New on the Sun? Solar scientists think they have spotted something new on the Sun after looking at imagery from the Solar Dynamics Observatory and STEREO spacecraft. What they noticed was "a pattern of cells with bright centers and dark boundaries occurring in the Sun’s atmosphere, the corona. These cells looked somewhat like a cell pattern that occurs on the Sun’s surface -- similar to the bubbles that rise to the top of boiling water -- but it was a surprise to find this pattern higher up in the corona, which is normally dominated by bright loops and dark coronal holes." "The coronal cells occur in areas between coronal holes -- colder and less dense areas of the corona seen as dark regions in images -- and “filament channels” which mark the boundaries between sections of upward-pointing magnetic fields and downward-pointing ones. Understanding how these cells evolve can provide clues as to the changing magnetic fields at the boundaries of coronal holes and how they affect the steady emission of solar material known as the solar wind streaming from these holes." Labels: Something New on the Sun? Hey North America Space Placers! There are some GREAT sighting opportunities for the International Space Station (ISS) this week. I am hoping to see a -3.4 magnitude (almost as bright as Venus) tonight. Just select your country and location and you are all set to go! Don't forget to wave at the million pounds of space hardware flying over and the 6 humans on board. Hey Space Placers in the WASHINGTON D.C. AREA! This will be the last time we see Discovery in the air - riding atop the 747 Shuttle Carrier Aircraft. NASA will be carrying the event live on the Internet so the rest of the world can tune in as well. This is literally a once-in-a-lifetime event so you should make every effort to see this historic event. I hope everyone had a good Easter or Passover celebration weekend. I recently blogged about the prolific Kepler planet-hunter mission being extended. Well, there has been an app created for the mission that allows you to follow along as an armchair astronomer-scientist! Created by UC Santa Cruz, the app puts "at their fingertips the nearly 2,000 distant planetary systems discovered by NASA's Kepler Mission. 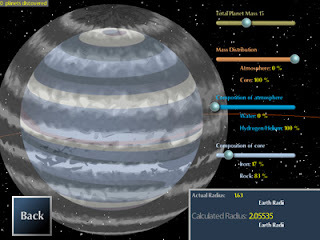 Kepler Explorer, an innovative app for iPads and iPhones developed by a team at the University of California, Santa Cruz, provides interactive displays of newly discovered planetary systems based on Kepler data. Now available for free from the iTunes App Store, Kepler Explorer was developed through the OpenLab initiative at UC Santa Cruz, which brought together faculty and students in astrophysics, art, and technology for a summer institute last year." How cool will it be to access a totally new world almost in real time through your iPhone or in my case iPad? Such is the power of the Internet. Been caught up in work the past few days - pretty hectic. Took some quality time last night to enjoy the sky and I look forward to doing the same tonight - might even get the telescope out. Last night's Full Moon was a sight to behold as it rose and I LOVE how the world looks in full moonlight.....it takes on a whole different perspective. You can see so much detail in the white and black moonlit landscape. Tonight the Moon will almost be full again and will have Saturn to the upper right with Spica next to Saturn. In the west as dusk darkens is Venus and to the lower of the Evening Star is Jupiter. The winter constellations are well on their way towards the western horizon and the brightest star in the night sky, Sirius, blazes away like a diamond in the sky in the south west. Orange Mars is still bright high in the south. The bright reddish-orange star you see in the east as it gets fully dark is Arcturus - the star of spring. Vega rises in the northeast at 11 p.m. to herald the going of summer. Get out and enjoy the sights of the sky tonight as there is plenty to see and enjoy. I am writing this in the light of the soon to be full moon with a wonderful breeze and the smell of spring to keep me company. 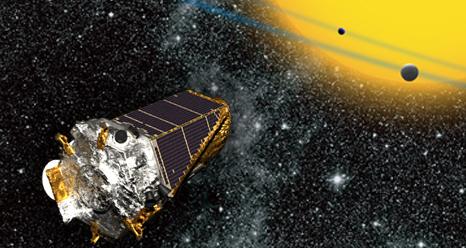 NASA has announced that that the wildly successful planet hunter Kepler mission will be extended for 4 more years. That is wonderful news in this budget cutting cycle that NASA is having to endure. Kepler continues to amaze with the numbers of exoplanet candidates that it finds and the astronomers associated with the mission keep finding more and more ways to use the spacecraft. The European Space Agency is hosting a cool contest that will be fun and educational to participate in. There are literally thousands of photographs taken with the Hubble Space Telescope (HST) and filed in the HST Archives that have never seen the light of day to the public. So ESA is opening up the Archive to the public so they may look for that stunning photograph never seen before by the public AND using provided software, add your own touch to the finished product. The contest will last until May 31, 2012. The winner will win an Apple iPod Touch. This week brilliant and beautiful Venus will be gliding by one of the prettiest star clusters and sights in the sky - the Seven Sisters or Pleiades. Go outside after it starts to get dark and find Venus in the western sky. This week Venus will be moving by the Pleiades, a small star cluster that looks for all the world like a little dipper - in fact I have had some people think they are viewing the Little Dipper (Ursa Minor - home of the North Star Polaris) when they see the Pleaides for the first time. The popular name for the cluster - The Seven Sisters - refers to the number of stars that can be seen with the unaided and healthy eye. The Pleiades is part of the winter constellation Taurus the Bull and forms the shoulder of the Bull. Use binoculars or a small telescope to enhance your view. The sky show will go on all week as Venus appraches, melds and then leaves the famous star cluster. Four months from now NASA's newest Mars mission, Curiosity will be preparing to land on the Red Planet. But where exactly will the one-ton, car sized martian science lab-rover land? A lot of thought went into where Curiosity should land and embark on a mission dedicated to finding the precursors of life. 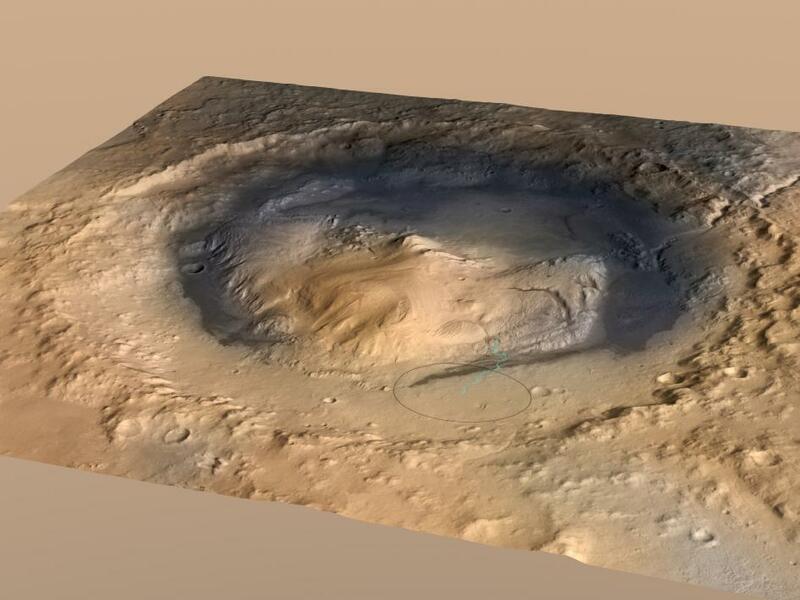 NASA had a number of areas in mind but finally decided on a mountain located inside of an ancient crater named Gale. Mount Sharps, informally named after prominent Cal Tech planetary geologist Robert P. Sharp, (1911-2004) , who was influential in the field and worked on several of the first Mars mission, is the landing zone. Mount Sharp is an impressive feature that is higher than the mountains of Colorado or Mount Rainier. It is a broad feature in Gale Crater and Curiosity will land in the level area shown on the graphic by the black ellipse and make its way towards areas of interest. As stated in the news release: "Some lower layers of Mount Sharp might tell of a lake within Gale Crater long ago, or wind-delivered sediments subsequently soaked by groundwater. Orbiters have mapped water-telltale minerals in those layers. Liquid water is a starting point in describing conditions favorable for life, but just the beginning of what Curiosity can investigate. Higher layers may be deposits of wind-blown dust after a great drying-out on Mars." This will be an amazing mission to watch via the Internet and it may be historic in that we may finally put to rest the question of whether Mars could have supported life in the past. But asI have said before, I think there is a very good chance that one day we will find life on Mars. As to whether Curiosity accomplishes the former or the latter only time will tell.